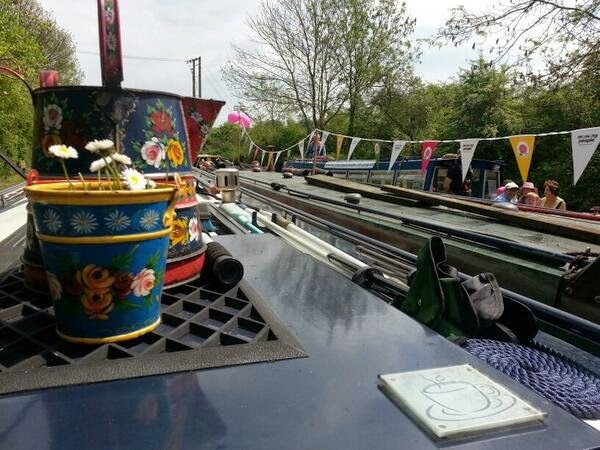 Every year we take our narrowboat, Kingfisher, to the Rickmansworth Canal Festival. It’s a wonderful event and hundreds of narrowboats attend. Our friends love coming up to see the beautifully decorated boats, the historic working boats, the boat tug-of-war and the many bands and artists that perform on the various stages. Because so many people love to visit us over the weekend, I thought it would be the ideal time to test out my baking skills (!) and raise a bit of money for Missing People. I must have chosen particularly reliable recipes, because everything turned out brilliantly. We had pistachio and cardamom brownies, rocky road, banana and blueberry muffins, brownie muffins, peach, apricot and almond muffins and a tea loaf. I also coated some strawberries with chocolate, and coated some frozen bananas with chocolate and flaked almonds. All the guests were keen to learn more about the work of the charity. I was able to tell them about the range of circumstances in which people go missing, the variety of reasons, the work we do to support families left behind, the campaigns and lobbying we do to influence change, the 24 hour help we can provide to young people who’ve run away and the things we can do to help people reconnect. Some of our guests had their own experiences of missing – either they knew someone who had been missing, or they’d run away themselves in the past. I had been a little nervous about asking people for money; after all it’s not what you normally do when you have a friend round for tea. I shouldn’t have worried though – everyone was enthusiastic and generous in their giving. At the end of the event I was thrilled to find out that we’d raised over £90 in total. I really enjoyed hosting my Everything Stops for Tea party, and would really recommend other people try it too. It’s a lovely excuse to spend some time with friends and not only does it raise money, but it also helps to spread the word about Missing People. Hopefully my guests will stay involved in future, and help to spread missing person appeals as far as they can. You can register to host an Everything Stops for Teaparty by visiting the Missing People website – you’ll be able to download bunting, posters, invitations, recipes and more. I hope you really enjoy hosting your party.